Pricing, Flavors, and Other Cake Info - Harriet's Creations, Inc.
For the best experience in gathering all of the information about our pricing, flavors, and filling options please visit our website on a larger screen such as a laptop or desktop computer. Our website is responsive and our pricing tables render best on larger screens. Thank you! To get started, you will need to decide on flavors, fillings, and make a choice on the type of exterior you might want such as icing or fondant. 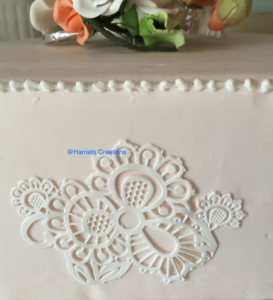 Harriet’s Creations offers 16 Standard Cake Flavors starting at $3.00 per slice for smooth sided design of buttercream icing. Our fondant covered Standard Cake Flavors start at $4.50 per slice for smooth sided design. A few examples of Standard Cake Flavors would be our Autumn Spice Cake™, Award Winning Almond™, and our very popular Lemon-Lime Punch™. We also offer 25+ additional Specialty Cake Flavors starting at $5.50 per slice for a smooth sided design of buttercream icing. Fondant covered Specialty Cake Flavors start at $7.00 per slice for a smooth sided design. A few examples of Specialty Cake Flavors would be Cherries Jubilee Jumble™, Colossal Caramel Cake™, and Hazelnut Happiness™. Each price point can be customized to meet your needs with endless flavor, filling, and top layer options. Any design work, over and above smooth sided, does add an additional charge subject to the design work type. Get Started Building your Cake! You will need to decide on flavors, fillings, and make a choice on the type of exterior you might want – icing or fondant. Use the below table to help determine which flavors are Standard vs. Specialty. Flavors containing nuts, chocolate, nut extracts, oils, or coconut are noted. As for fillings, some people opt for a simple fruit filling between layers, instead of buttercream filling. In England, they do use fruit filling under fondant. If you like fruit filling, we recommend using it between layers. Some of our most popular cakes mix a fruit filling with a creamy icing, to make a fruity buttercream filling between layers. Unless noted, we do not charge for fillings. Some fillings do add additional cost to a cake and are noted here. Use the below table to help determine which fillings are Standard vs. Specialty. Fillings containing nuts, chocolate, nut extracts, oils, or coconut are noted. Use the below table to help determine which icing flavors are Standard vs. Specialty. Icing flavors containing nuts, chocolate, nut extracts, oils, or coconut are noted. What is the difference in Filling a cake and Torting a cake? Torting is simply cutting one of the layers (2″tall) in half and placing a filling inside. The torting is an additional step which uses more filling and time, so I do charge for torting. If you want (3) “Stripes” of icing when you cut your cake, then you want Torting. Filling is when I’m simply sandwiching together the two layers (2″ tall each) of the same size to make one Tier. At Harriet’s Creations, all tiers are approx. 4″ tall with one “Stripe” of icing. There are any number of toppings which go on the surface of a cake, as I’m sure you’ve seen. Some look abundantly smooth; others are textures, much like a crafting technique. So first, let’s talk about the outside surface icing. This is the most commonly used in the USA. Buttercream can be made with PHO shortening, Palm or Soy, a combination of both shortening and butter, or just butter. Buttercream icings are soft, sweet, and sensitive to heat and humidity. Buttercream can sag, melt and slide off the cake if not handled properly. If fresh ingredients such as real butter, eggs or fresh egg whites are used, this icing can be prone to spoilage. Limited exposure to heat and humidity is recommended. All Butter icings I make in the winter only. I do not use “real butter” for icing in the summer months, but will use it between January and April, and again in November through January if you ask for it. It is not a white icing. A difference in price exists between the standard buttercream and the 50/50 split icing. You must ask for the “real butter” icing when ordering. This is used at your own risk due to weather affecting the fluidity of the icing. 50/50 icing add $50.00 to the overall price of the cake. The cake will be quoted with standard buttercream pricing and then $50.00 will be added to the order. My standard Buttercream icing has been on all my cakes when they won Blue Ribbons at the Mid-South Fair in the Professional Division of the Culinary Arts Category. This fair is held in the September heat and holds up very well indoors. The fair is now called the Delta Fair, and is held at the Agricenter International. My icing is made with a PHO free shortening. **Please note, many of these icings contain nuts, or nut based products. Please consider the possibility of allergies of your guests when ordering. If you are ordering a Standard Cake Flavor, and upgrade to a Specialty Cake Icing, the price per slice increases by $1.00 per slice. Italian Meringue and Swiss meringue are also types of icings, however, not offered here using current pricing. Marzipan: Marzipan is an oily dough made from very finely crushed almonds. It is used in England to cover the tops of fruit cakes, which is the traditional wedding cake there. Marzipan is ivory in color and quite expensive to use. It can be colored. We use it most exclusively here in America for making edible fruits in all shapes, sizes, color, and varieties. Most times the English cakes are then covered in Royal Icing or a Fondant Icing covering to complete the cake. Rolled Buttercream: Rolled Buttercream has a smooth look like Fondant, but shines. It is not Matte in it’s final appearance. Rolled Buttercream is a bit more to add to the cost of a cake here, as it’s made from scratch.So, if you like the very shiny, smooth look, you could go with Rolled Buttercream. This product is very soft and not recommended for outdoor weddings cakes. Rolled Fondant: Rolled Fondant is a sweet, silky smooth icing that has a dough or clay-like consistency. The steps to use Fondant begin with softening the fondant by kneading, rolling it out with a rolling pin or machine, draping it over a cake, and then smoothing it to conform to the cake shape. 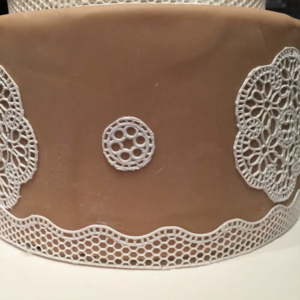 Rolled Fondant can be modeled, formed, twisted, imprinted, embossed , cut out to form lace panels which are then placed on the fondant covered cake. Rolled Fondant can be used to make bows, flowers and swags. It can be painted on, imprinted, crimped or left smooth. Its’ versatility makes it a very good medium for most designers with years of experience in hand manipulation and not entirely using pre-made molds, thus creating more one of a kind cakes. For saving labor, admittedly, you can’t beat molds for the design work on your fondant cake. It comes down to which you prefer, hand crafted, or molded to look like other cakes you’ve seen. At Harriet’s Creations, we can do both. Fondant costs a bit more, but the look is worth it. Our fondant comes in three varieties, Vanilla (Marshmallow flavor), White Chocolate, or Dark Chocolate. 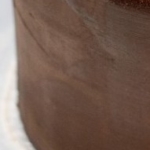 The Dark Chocolate is used often on Mens’ cakes. Vanilla and White Chocolate can be flavored or colored to match your preferences. In other parts of the world it is commonly known as “Sugarpaste”. There is a distinctive property to Fondant and that is it is “chewy on your palate”. I coined this phrase originally, as it is not like the Buttercream creaminess you are probably used to. Rolled Fondant properly prepared should not be brittle hard when cutting. It is kept soft by a covering of Buttercream which is on the cake as the “glue” which holds the fondant on the cake. Then the cake is chilled. Hours before serving, the cake is taken from the cooler, kept at room temperature so the sweat has time to evaporate, keeping your fondant yummy and soft! 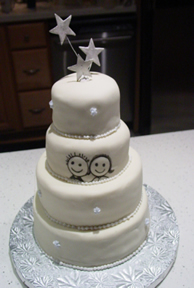 Fondant products used by cake decorators vary as widely as the experience of the decorators you might interview. When people come to me and tell me they have “heard” that Fondant tastes bad, I ask them if they have personally tried it. Most say “No”, and once they taste a good product, there is no objection to using it. My opinion on why some people tear it off the cake is that; they never tried properly prepared fondant, don’t like the chewiness, or they simply haven’t tried a good tasting, chocolate fondant. Don’t peel it off! Your guests will follow your lead when you serve cake to your new hubby. Try my White Chocolate Fondant! It is excellent in flavor and the finest quality Harriet’s Creations offers. All fondant covered cakes are priced the same whether, Dark or White Chocolate, or Vanilla. Sugar Veil Icing: This is a relative new comer to the decorating of cakes. If you know of Royal Icing, think of Sugar Veil as bendable Royal Icing. Really cool stuff! This is used to make real life bows, which have a bit more of a natural look, in that, sometimes they will sag like a real ribbon bow. It is like Royal Icing in that it IS affected by humidity, so using it in Summer for a bow might not be too wise unless you like wilted bows. They can be placed over Gum Paste for stabilizing however. Sugar Veil makes beautiful lace pieces, lightweight stripes, and beautiful hand cut border work. Cake Lace is a similar product using a silicone mold which gives a beautiful finish to a cake. It is best used in Summer months. Lace panels are made from Sugar Veil icing or a similar product. 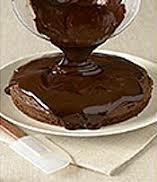 Chocolate Ganache: Chocolate Ganache is quite a versatile icing as well. It can be poured as a smooth glaze over the cake surface. It can be whipped to make a fluffy frosting, or it can be used to fill the layers between cakes. It can be used to make truffles. 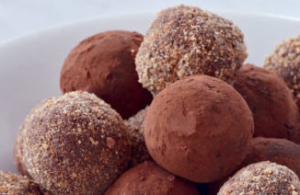 If you’re a chocoholic-this is for you! Since Ganache, white or dark uses Chocolate and Cream in the recipe, you will pay more for this icing and of course, in Summer, not as stable in the summer heat. Chocolate Ganache is often used as a first coat on a cake, especially on a square cake to make the corners crisp. It can also be used as a crumb coat of sorts, but either way, a fee of $45.00 is added to your total purchase which includes ingredients and time over and above the regular buttercream icing. We hope this will give you some insight into what can seem like an overwhelming task. No worries. We are here for you, just give us a call .